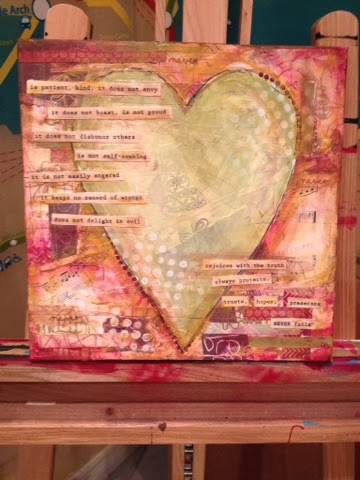 I was posting an "in progress" photo of a collage heart and my friend Jeri asked me if I would do a custom piece. A custom piece? Me? Oh, the pressure. The nice thing is that she gave me a color pallet and an inspirational phrase with "love is patient, love is kind, love is ..." The part that resonated the most with me is the ending "it never fails." Thus the title of the painting. This one is for Jeri, who sought happiness and took risk for love. She is an inspiration. Think about it, it is important to find happiness, pursue joy, love who you are and what you do. And if you don't, maybe it is time to change directions.